Let’s go back to Mayday, 1975, the end of fixed commissions on the New York Stock Exchange and the beginning of the financial deregulation movement in the United States. The advent of competition among Wall Street investment banks seemed like a little thing at the time. But then so did an “Open Letter to Hobbyists,” about software piracy, the following year, from a college drop-out named Bill Gates (“Who can afford to do professional work for nothing?”). And in 1977 Lewis Ranieri coined the word “securitization” to describe Salomon Brothers’ underwriting of the first-ever mortgage pass-through security. The copydesk at The Wall Street Journal objected that there was no such word. Thirty years later, when the crisis of 2007-08 was over – after the Panic of ’08 had subsided, global trade had ceased its alarming collapse, President Obama had taken office, the extent of the recession was coming clear, and grinding politics had resumed – Moritz Shularick and Alan Taylor produced a picture that, in due course, would make clear the broad outlines of what had happened. The economic historians – Schularick from the Free University in Berlin, Taylor from the University of California at Davis — had met in London in April 2009. Theorist John Geanakoplos had published a widely-discussed paper on leverage cycles the September before. What, the pair wondered, would a history of money, credit, and output look like if it were long enough to gauge such things? Taylor had accumulated much historical data for an earlier paper on international currencies and capital flows. After a few months of combing libraries they had banking records for 14 developed nations over 140 years. Their summary figure is here. Their paper, Credit Booms Gone Bust: Monetary Policy, Leverage Cycles and Financial Crises 1870-2008, appeared in November, mostly eclipsed by excitement that accompanied the publication two months before of This Time Is Different: Eight Centuries of Financial Folly (Princeton), by Carmen Reinhart and Kenneth Rogoff. Schularick and Taylor were not self-effacing about what they had found – two distinct “eras of finance capitalism” over the previous 140 years. The first, an “age of money” that was dominated by the gold standard, lasted from 1870 to 1939. The second began in 1945, as different monetary and regulatory frameworks were adopted and rebuilding from the war commenced. By 1970, the various aggregates surpassed their prewar highs, relative to GDP. 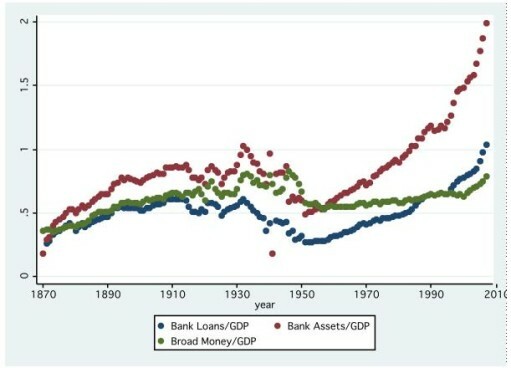 Thereafter the stable relationship between money and total bank lending of the hundred years, each relative to GDP, remained mostly intact – but total bank assets had increased dramatically. Had the ratio of bank assets to GDP been allowed to collapse in 2008, Great Depression II surely would have ensued. But the trades didn’t fail en masse; the market didn’t collapse, thanks to timely lending by the Fed; and the system of collateralized banking remained intact. In November, 2009, the recognition of all this lay in the future; not even the hazy descriptive term, “the shadow banking system,” had yet come into use. There had been, Schularick and Taylor noted, periodic warnings that too-generous credit would lead to instability. The most striking of these had come from Hyman Minsky, Schumpeter’s onetime student, who argued, none too clearly, that periodic “displacements” – large new opportunities for profit, none of them quite the same as those before, but all similar in some degree – could lead to booms which, because of the dynamics of capitalist finance, could be expected to ultimately end in crashes. Minsky’s views had been communicated to the reading public mainly by Charles P. Kindleberger’s little book, Manias, Panics, and Crashes: A History of Financial Crises. Minsky was deemed unusually pessimistic, even “lugubrious,” Kindleberger wrote but the general validity of his model seemed to hold up well against the past. Milder cautions in the present – by Henry Kaufman, Alan Sinai, Claudio Borio and William White, among others – were all but unnoticed. Such trepidation contrary to the spirit of the age in economics, which, since the Modigliani-Miller theorem of 1958, held broadly that because debt and equity were formally equivalent debt didn’t matter. The details of firms’ capital structure were pretty much beside the point. Schularick and Taylor termed this the amalgam of paleo-Keynesian, New Classical and finance doctrine the “irrelevance view” of credit, and noted it replaced a “money view” of an earlier era, in which the level of bank lending is of no great importance, as long as bank liabilities closely track narrow and broad money aggregates. True, a “credit view” had since the 1980s begun to make its way, led by Ben Bernanke, among others – apparently just in time. The shades of Henry Thornton, Walter Bagehot, Irving Fisher and Milton Friedman had been evoked. And that is where matters stood in November 2009. Let’s think a little about that global boom and why the banking system began to change as it did in the 1970s. This is not a matter of business cycles, as identified by the National Bureau of Economic Research, or, as yet, the national income and product accounts assembled by the Bureau of Economic Analysis of the Commerce Department. Much of what we know about these thirty years of “structural change” we know thanks to journalism. Even before deregulation formally began, there was plenty of banging at the gates. Henry B.R. Brown and Bruce Bent, executives of the Teachers Insurance and Annuity Association, took advantage of a loophole to found the first money market mutual fund, in 1971. The same year former Marine Corps captain Frederick Smith, just back from Vietnam, used his $6 million inheritance to start Federal Express. And William G. McGowan, a turnaround veteran and venture capitalist, renamed a little microwave carrier company MCI Communications and entered the long distance telephone business. And Helmut Weymar, a cocoa buyer for Nabisco, in 1969 had started the first computer-based quantitative hedge fund, backed by his thesis adviser, Paul Samuelson. Is there a name for this way of making a living? It depends on who does the naming. To those whose profits were targeted – the banking industry, the post office, the telephone company, commodities producers – these companies were simply pirates, bending or breaking well-established rules. Only after the venturers succeeded were they accorded the more genteel appellation “entrepreneurs.” Have a look at Harry Brown’s obituary to see the hazy glow with which a pirate who starts a $3.5 trillion industry is remembered in his old age. So what were Treasury Secretary George Shultz and his deputy William Simon thinking when they commissioned the report by University of Chicago Graduate School of Business professor James Lorie that led to the passage of the Securities Acts Amendments of 1975? It was the most important legislation affecting the financial community since the New Deal (and, in the years since 1975, the least remembered!). You can’t tell much from Simon’s 1978 book, A Time for Truth, an over-the-top polemic written with the help of Edith Efron, an acolyte of Ayn Rand. What I learned from Simon’s A Time for Reflection, published posthumously in 2004, was mainly that as deputy secretary he dined occasionally with Milton Freidman and George Stigler at Shultz’s home in Washington in 1972. I was just entering the business then; most of what I know about Mayday I learned from The Last Days of the Club: The Passing of the Old Wall Street Monopoly and the Rise of New Institutions and Men Who Will Soon Dominate Power in America (1975), by Chris Welles, a contributing editor to the indispensable glossy monthly Institutional Investor. Soon the banks, with almost unlimited access to capital, were moving in on lines of business that once has been Wall Street’s own, including investment banking, mutual funds, and clearance and settlement of trades. Investment bankers replied in kind, Drexel Burnham Lambert with junk bonds, Salomon Brothers with securitization, First Boston with the tranching of collateralized debt obligations, Merrill Lynch with cash management, J.P. Morgan with swaps. I’ve read a lot of the history of those years: Connie Bruck, Jesse Kornbluth and Benjamin Stein on Milken; Bob Tamarkin on Leo Melamed; Phillip Zweig on Walter Wriston; Kathleen Day on the S&L crisis; John Wier Close on Joeseph Flom and Martin Lipton; Victor Niederhofer on himself; Amy Stone and Mike Brewster on Sanford Weill; Gillian Tett on Blythe Masters. In The Bankers: The Next Generation, in 1997, Martin Mayer wrote, “Banks as we know them, from the Medici and the Fuggers to First National This and the First National That, have seen their day. But bankers we will always have with us.” With their history of securitization, All the Devils Are Here: The Hidden History of the Financial Crisis (2010), Bethany McLean and Joe Nocera showed how right he was. I’ve read a lot of the history of computers, too. David Lundstrom on Univac and the origins of the industry in Philadelphia; Karl Wildes and Nilo Lindgren on the early history of real-time computing at MIT; Emerson Pugh on the considerations decisions that led to the IBM system/360; Kenneth Flamm on the government’s role; T.R. Reid on Jack Kilby and Robert Noyce and semiconductor chips; Tracy Kidder on competitive culture; Paul Carroll on the steps by which Bill Gates hornswoggled IBM; G. Pascal Zachary on Microsoft’s victory over Digital Equipment; Mitchell Waldrop on the history of the Internet; John Cassidy on the dot.com bubble; and, on the subsidiary technologies – satellites, fiber optics, packet switching, the bar code, the open source movement – good books too numerous to name. China? Well, I remember the shock of reading Stanley Karnow’s Mao and China: From Revolution to Revolution, in 1972, the first accurate account of the depredations of the Cultural Revolution. Thanks to it, I was much less surprised by events after 1976. The Search for Modern China, in 1990, by the great historian Jonathan Spence, seemed pretty completely overtaken by events. I didn’t read another book on the topic until China Shakes the World, in 2006, by James Kynge, the Financial Times correspondent there. In Age of Ambition, Evan Osnos says the transformation occurred from the bottom up; Ronald Coase and Nin Wang, in How China Became Capitalist, say top down. Nobel laureate Coase should know; for two decades, he was deeply involved. Not me; after all these years, I have never been. Politics in those years – or perhaps the philosophical histories with which individuals orient the stories of their lives in time — is a formidable topic, obviously much more complicated than “Republicans” and “Democrats.” The fundamental document here is Postwar: A History of Europe since 1945 by Tony Judt (Penguin, 2005). An equivalent grand narrative of the Unites States since 1932 has not been written. When it is, books such as The Road to Serfdom, by Friedrich Hayek, The Affluent Society, by John Kenneth Galbraith, and Capitalism and Freedom, by Milton Friedman, will have a place. As for the regulators who populate the story of the thirty-year boom, George Shultz and Paul Volcker are clearly the most important. Both are still active participants in the controversies of the day. But where Volcker’s role has been extensively examined – by William Neikirk (Volcker: Portrait of the Money Man, 1987 ); Wlliam Greider (Secrets of the Temple: How the Federal Reserve Runs the Country, 1987); Robert Samuelson (The Great Inflation and Its Aftermath: The Past and Future of American Affluence, 2010); and economist William Silber (Volcker: The Triumph of Persistence, 2012) – Shultz, a forceful advocate of a carbon tax, so far mostly has been overlooked. Thomas McCraw won a Pulitzer Prize in 1984 for Prophets of Regulation, portraits of Charles Francis Adams, Louis Brandeis, James Landis, and Alfred Kahn. There is as yet no comparable account of the life and times on Stanford Law School professor William Baxter, the Assistant Attorney General for Antitrust in the early says of the Reagan Administration, who broke up the century century-old “Bell system”: of AT&T into seven competing operating companies and withdrew the long-running government case against IBM Corp. on the same day in 1982. The point is that it is a very complicated undertaking to tell a story of the boom. As noted, “new” growth theory in economics, once a highly promising subject, has mostly petered out. In 1986, the economic historian Jonathan Hughes, of Northwestern University, brought out a new edition of The Vital Few: The Entrepreneur and American Economic Progress (Oxford), originally published well ahead of its time, in 1965. It is a model of thick description of economic change: essays on not just Eli Whitney, Thomas Edison, Andrew Carnegie, Henry Ford, E.H. Harriman and J, Pierpont Morgan, but William Penn and Brigham Young, two religious leaders who founded American states, and Mary Switzer and Marriner Eccles, “bureaucratic entrepreneurs” who, respectively, transformed US social policy towards disabled citizens and reorganized the Federal Reserve System. Someone, someday, will write a similarly knowledgeable and sober account of the lives and times of some of the most significant figures of the thirty-year boom. I would still like to try my hand at a few thousand words about the drivers of change. But not today, not here. For the old lions, Paul Samuelson and Milton Friedman, the ’80s meant a bittersweet departure from the center stage of economics after forty years of dominating the scene. The two had entered their sixties; neither was out of steam. But the leaders of the next generation had become apparent: Lucas, in macroeconomics; Kenneth Arrow in nearly everything else. The election of Ronald Reagan was a triumph for Friedman; they had known each other since Friedman spent a quarter at the University of California at Los Angeles, shortly after Reagan had been elected Governor of California.He was invited to lecture in China. And the international success of Free to Choose kept Friedman in the public eye. But Paul Volcker took a different approach to monetary policy from the one Friedman advocated, and Friedman’s forecasts became markedly worse. The editorial page of The Wall Street Journal adopted as its champion Friedman’s long-time rival in currency matters, Robert Mundell, now teaching at Columbia University, and went all in for Mundell’s young associate, consultant Arthur Laffer. A research appointment at the Federal Reserve Bank of San Francisco was not the same platform as the University of Chicago. Friedman still had his membership on the President’s Economic Policy Board, but after he “savaged” Volcker to his face before the president in a meeting in 1983, both men lost influence. Pointing a finger at Volcker, Friedman said (according to Newsweek’s account), “because of the policies of the Fed under that man we have had an inflationary surge in the money supply that is going to have to be corrected.” Volcker was not reappointed. Edward Nelson, of the Federal Reserve Bank of St. Louis is writing a scientific biography of Friedman. It will make interesting reading when it is done. In March 1981, Friedman wrote his Newsweek column in the form of a letter to Philip Handler, president of the National Academy of Sciences, advocating major cuts in the budget of the National Science Foundation, as a step towards the abolition of the NSF. The Reagan administration had proposed sharp cuts in the economics program. Friedman argued the government shouldn’t pay for any scientific research. True, the NSF had funded much good science; but it had paid for much bad science, too, including, he wrote, overmuch mathematical economics. The great scientists of the past had done without NSF funding. Einstein did his work in a government patent office; general relativity might never have made it past a peer-review panel. “The innovative ideas that have stirred controversy in economics since NSF funding of economics began two decades ago owe little or nothing to NSF funding,” he wrote. Thus did Friedman dismiss the agency that Paul Samuelson had brought to life in 1945. Perhaps more important, by extension he dismissed the program of government fellowships, awarded by competitive exam, that had sent Samuelson to graduate school in 1935, all expenses paid – and countless others since, many of them as impecunious as Friedman had been in 1932. The NSF ran similar programs in mathematics and many sciences, and the principle had been extended, by Sen. Jacob Javits (R-NY) to humanities. NSF research grants funding had helped build the Massachusetts Institute of Technology into a powerhouse to rival Harvard, and played a similar role at many other public and private universities. No Samuelson column followed Friedman’s. Samuelson never wrote again for Newsweek . He resigned the column he had written for fifteen years. When, many years later, I asked him about his timing, he firmly denied that it had anything to do with Friedman’s column, and wrote me a letter for the file the next day repeating what he had said. I have always wondered if he sought to defuse the matter out of habit. That he and Friedman had remained on civil terms for seventy-five years was clearly a source of pride, though privately he grew less tolerant of his rival after 1980. Samuelson, too, was in mild recession in the ’80s. Keynesian economics hadn’t yet rebounded from the biting criticism of the New Classicals in the ’70s. Tensions were growing within the MIT department over appointments and the direction of future research. Samuelson formally retired in 1985, at 70, to make room for others. He had plenty to engage his professional attention. Commodities Corp., which had discovered such natural traders as Paul Tudor Jones and Bruce Kovner, was winding down, but Samuelson’s interest in Warren Buffet’s Berkshire Hathaway was gearing up. The Vanguard Group, whose godfather he had been ever since founder John Bogle introduced the first index fund, was thriving. Samuelson’s friends and colleagues James Tobin, Franco Modigliani, and Robert Solow received Nobel Prizes. To the young lions of Keynesian economics in the ’80s, rational- expectations macroeconomics and real business cycle theory posed a considerable bar. To work in the new traditions required a considerable investment in new tools and mathematical techniques, and, even fully teched-up, didn’t seem to speak very directly to policy. A strong corps of economists went to work to fashion a “new Keynesian” version of the latest general equilibrium economics. But gradually one rising star of saltwater economics after another left academia for a policy job. Martin Feldstein, of Harvard University, was the first. As something of an acolyte of Milton Friedman, Feldstein was never very high in salinity, but he demonstrated plenty of professional backbone as Chairman of the Council of Economic Advisers under Ronald Reagan for two years in the early days of the controversies over deficits before returning in 1984 to Harvard and his position as president of the National Bureau of Economic Research. Stanley Fischer, of MIT, was next, wrapping up a highly successful research career in order to serve as chief economist of the World Bank (a path that led to leadership positions in the International Monetary Fund, governor of the Bank of Israel and, currently, vice chairman of the Fed). Lawrence Summers, Feldstein’s student, served as campaign economist to Democratic candidate Michael Dukakis in the 1988 presidential campaign and succeeded Fischer at the World Bank before joining the Clinton administration, where he advanced to Secretary of the Treasury. Soon the flood was on: Jeffrey Sachs, Joseph Stiglitz, Olivier Blanchard, Kenneth Rogoff, Gregory Mankiw, Glen Hubbard, and Christina Romer were among those MIT- or Harvard-trained economists who served in government jobs or NGO positions. Paul Krugman retooled as a journalist. Lists of MIT and Harvard graduates in high positions in European, South American, and Asian governments were even longer. Did this differ in kind, and not degree, from the trajectory of academic economists dating back to to the New Frontier, if not the New Deal? I think so. In 2006, Harvard’s Mankiw, in an article for the Journal of Economic Perspectives argued, as I did in a book, that the differences in interests among economists were best understood as being similar to those between scientists and engineers. The early macroeconomists, led by Samuelson and Friedman, had resembled engineers seeking to solve practical problems, Mankiw wrote; macroeconomists of the past several decades, led by Tjalling Koopmans, Jacob Marschak, Kenneth Arrow, and others had been more interested in developing analytic tools and establishing theoretical principles. Their students the ’80s had joined teams along similar lines. “Recently Paul Romer, of New York University, introduced a different distinction to elucidate some of the controversies in present-day macro – between bench science and clinical medicine. Both analogies will get plenty of elaboration in future years, for this is what changed in kind in the ’80s: economics developed a clinical/engineering wing. In 2001, Alan Blinder and Janet Yellen published The Fabulous Decade: Macroeconomic Lessons from the 1990s. They had in mind mainly the policies of the Clinton administration, a combination of modest tax increases and monetary easing that led to rapid income growth and low inflation in the second half of the decade and to a US budget surplus by its end. Soon economists had begun calling it “the Great Moderation” But the ’90s were fabulous in other ways as well. After China’s entry into the world market system had become clear, the hold of the Soviet Union on its European satellites had become shaky. Poland was the first, followed by Czechoslovakia, Hungary, and, in 1989, East Germany. The Tiananmen Square protests of 1989 checked the spread of democracy in China, but by 1991 the Soviet Union was on the verge of collapse. It dissolved at the end of the year. Rapid global growth ensued, punctuated by financial crises in Scandinavia, Mexico, Asia, and Russia. There was often desperate trouble in the Balkans throughout. The ’90s saw the rise of the Internet. What had been a military network with around 60 nodes, or points of connection, in 1977, was turned over to the National Science Foundation in the ‘80s and to private businesses in the ‘90s. Once the World Wide Web was established, in 1991, and the first browsers installed on personal computers, after 1993, the Web became a highway of commerce, so quickly populated that the second half of the decade saw a boom, a mania, and a crash. Finance, too, raced ahead. After the scare of 1987, when the Dow Jones Industrial Average dropped by near 25 percent in a single day, a whole new roster of firms appeared to take the other side of increasingly complex deals. A savings and loan crisis in the United States stimulated a new wave of interest among economists in banking. Deregulation accelerated; Albert Wojnilower, a Wall Street economist, compared the “decompartmentalization” of the US financial industry to letting the animals of a well-ordered zoo out of their cages. By the end of the decade, the Glass-Steagall and McFadden Acts had been superseded by the Financial Services Modernization Act of 1999. You know the rest: there was a mild recession, a housing boom, a saving glut, an invasion of Afghanistan and Iraq, and, in 2004, a Nobel Prize for real business cycles to Edward Prescott and Finn Kydland.